Each year on a Saturday in late winter, Chesterbrook is transformed from our school to an amazing Indoor Carnival with everything from moon bounces, games and raffles to bake sale, prize rooms and much, much more. Funds raised go to support staff development; Grade wide Academic Grants (Greco Day and Colonial Day); Cultural Arts and Science Assemblies; Family Fun Events; Health and Wellness programs; Technology upgrades; Instructional Materials and much more. Fun Fair is Chesterbrook PTAs largest Fundraising event of the year. In addition to being an important fundraiser, the Chesterbrook Fun Fair is a great way for our community to get together and have a great time having fun and getting to know each other better. Please Help Make the Fun Fair a Success! It truly takes a village to make Fun Fair a success. There are so many ways to help. Join the Committee: The Fun fair committee is always looking for new members to help organize the event. Planning begins in November/December. Interesting in joining the committee or want more info? Contact co-chairs, Linanne Breslin and Claire Erlanger at funfair@chesterbrookpta.org. Volunteers: Want to help, but only have a few hours? The Fun Fair is not possible without volunteers before, during and after the event. There are many shifts at varying times, so there is sure to be a shift that suits your schedule. There are both adult and student shifts. Middle and High School students can earn Community Service Hours. Watch for detailed signups! 6 weeks prior to Fun Fair, ‘Games Tickets’ and ‘All Day Wristbands’ will be available at discounted rates. Wristbands provide unlimited play for all games and moon bounces. Wristbands are limited to three uses for Sweet Walk, Pick A Pocket and Lollipop Tree. Food and teacher/class basket raffle tickets are not included in wristband price. Each year, our wonderful teachers at Chesterbrook Elementary School donate exciting activities and experiences for your children for the much anticipated teacher raffles. 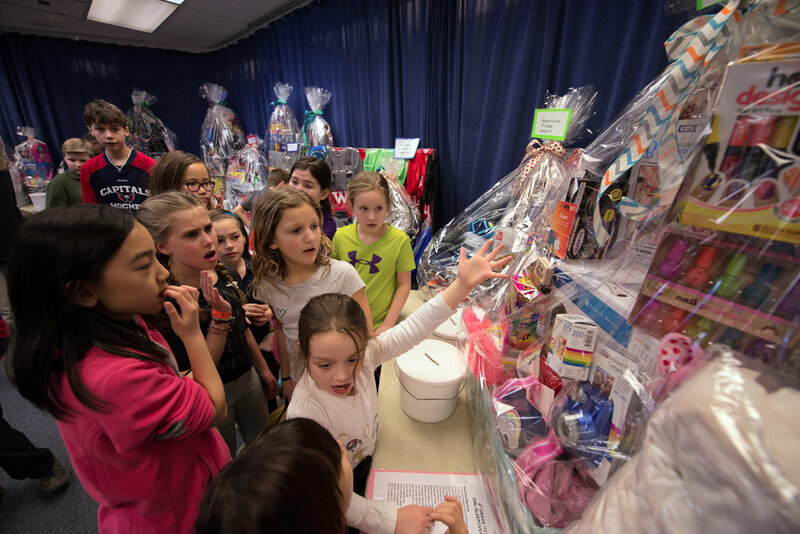 The kids look forward to the amazing basket raffles every year! Thanks to the generous parent donations, each grade puts together a themed basket full of amazing items. Themes have included, Summer Fun, Sleepover Party, Game Night and more.